These gorgeous flowers are actually quite small and but for their attractive golden colour would have missed my eye. Known down the centuries by both Indian and Western Herbal Medical practitioners, all parts of the plant are used for curing various ailments. 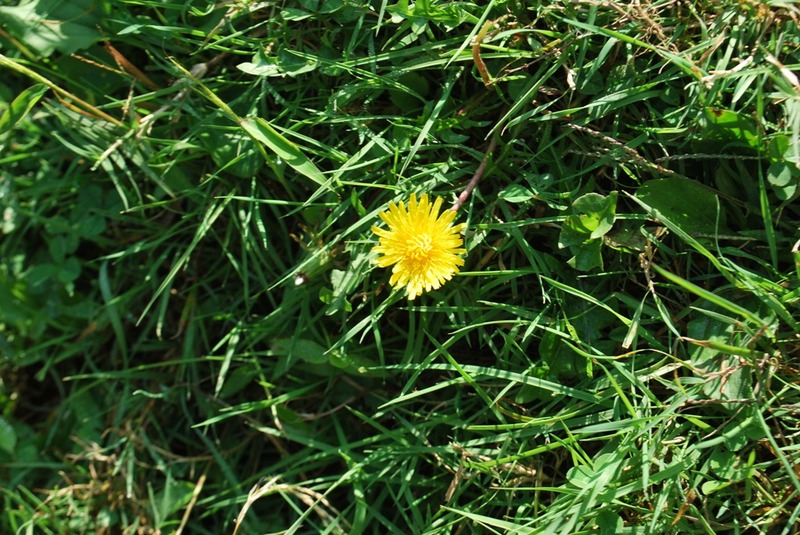 The Dandelion is particularly useful to cure ailments of the Liver and Kidneys. The flower and leaves are also used to make wine and salads respectively. The leaves are a rich source for various vitamins and minerals . 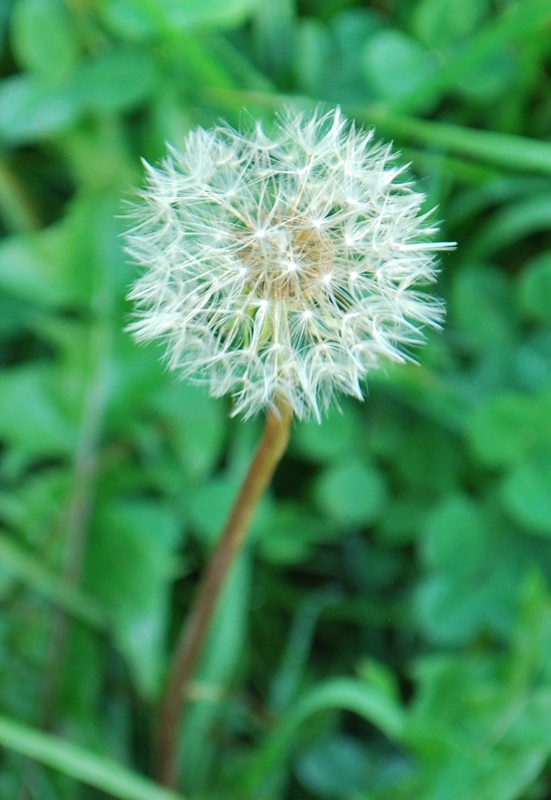 It was only upon writing this article that I realized the Puffball is none other than the ripe fruit of the gorgeous golden yellow dandelion flower. The seeds are dispersed by the wind and have inspired famous poets like William Wordsworth. It is however an invasive weed and infests the crops of farmers around the world. Do keep reading for more interesting anecdotes about Himalayan wildflowers. The ship of the desert or Camels are naturally adapted to the way of life in a desert. North Western Rajasthan is the natural home to these enchanting creatures of God. Numerous folk tales recite the tales of how the camels came to inhabit Earth. Goddess Parvati ( the consort of Lord Shiva) is fabled to have sculpted the Camels from clay and the Lord is supposed to have infused the breath of Life in them. The story goes on to say they initially had 5 legs, but were then unable to walk, so Lord Shiva folds the fifth leg and pushes it into the chest, this then forms the hump and leaves a mark as well. The story continues as the Camels create mayhem by going about their merry ways and eat up all the foliage. The Lord Shiva then creates the RAIKA (also called Chaamad) from his body( chamdi or skin ) to tend to camels and thus restore order. The Raika are a unique community of camel herders and breeders who survive to this day in the colourful state of Rajasthan in India. 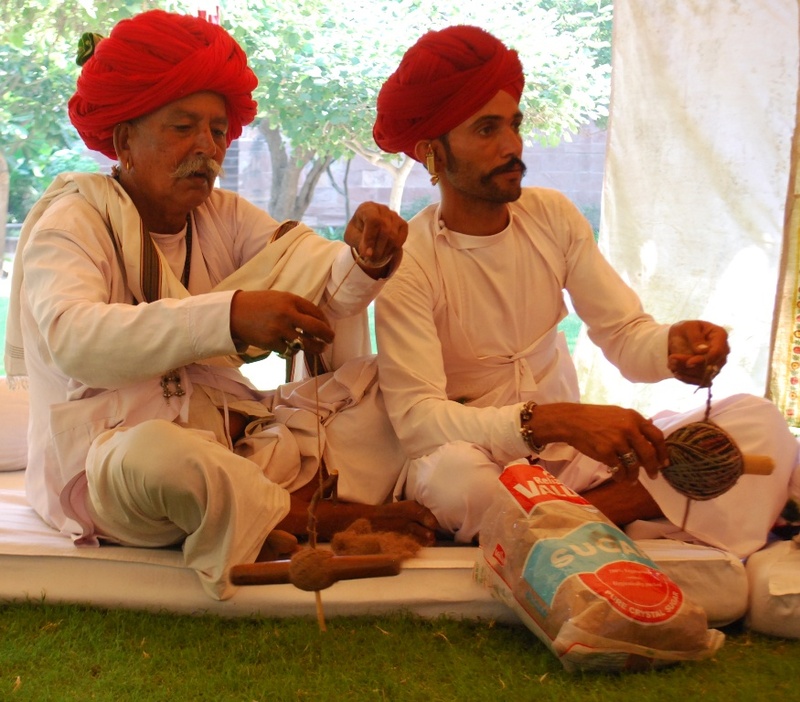 The following picture shows three Raika men in traditional attire with their musical instruments at the extravagant annual musical festival RIFF held at Jodhpur. The backdrop is that of a hand painted Phad which tells the epic story of a local deity Pabuji. The Raika firmly believe they were born for only one purpose, that is to take care of Camels. Their lifestyles and future are thus delicately bound to Camels. 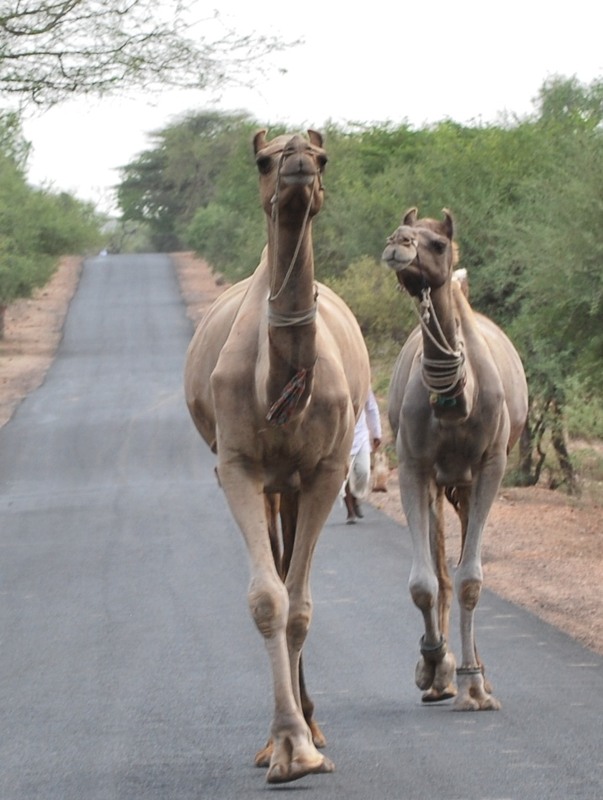 With modernization and mechanization, the demand for Camels as a means of transport has sharply declined. Spinning yarn from Camels hair and making Carpets and other textile products is one of several ways for the Raika to survive. Do notice the leaves at the back of the gorgeous turban of the elderly Raika. The extremely intricate relation between nature, animals and man is highlighted by the lifestyles of this amazing and enchanting community called THE RAIKA. 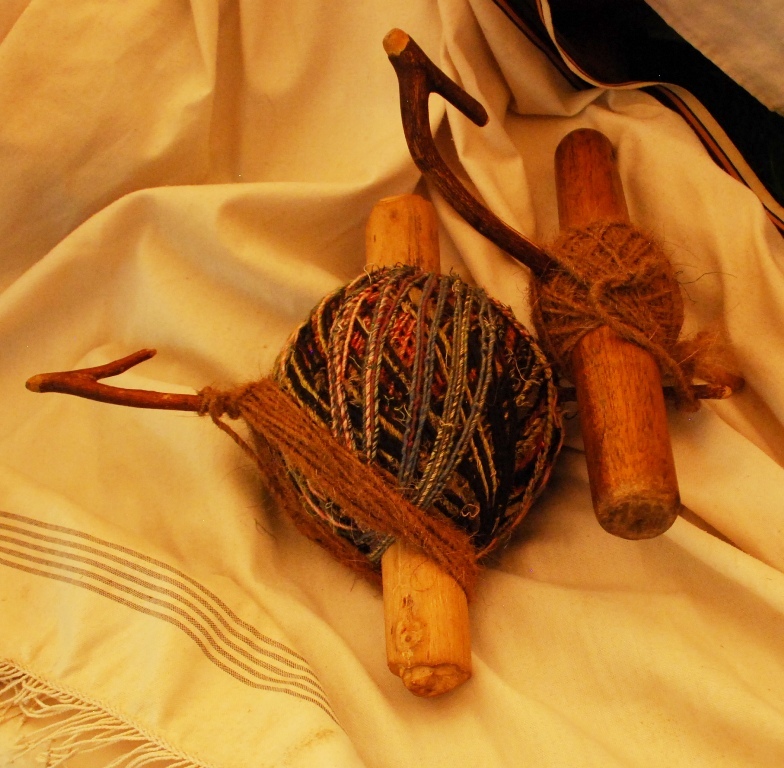 A closer look at the Bobbins shows how the Raika use the twigs of the desert trees and camel’s hair. 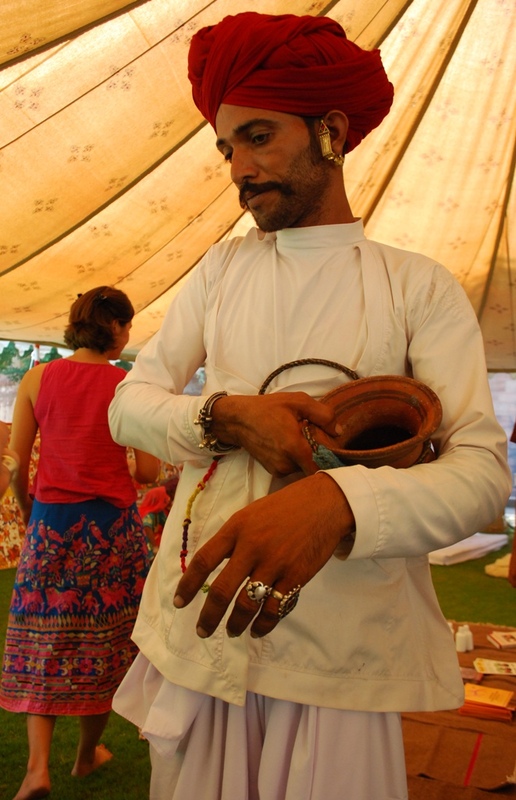 The gorgeous but large turban is made from 10 yards ( 9 metres) of cloth. This large cloth acts as a protection against the scorching heat of the desert , as a tether for camels and also as protection against angry camels. 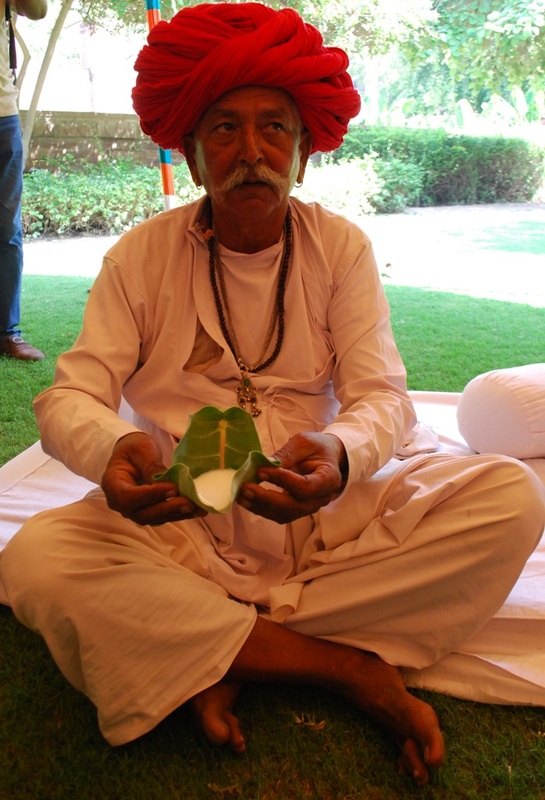 The elderly Raika has Camel’s milk in his hand in a practical and environment friendly container, the leaf of the Aak Shrub. The desert is an unusual forest and the preservation of water is a compulsory adaption for all forms of life. The Aak ( Hindi and Sanskrit ) bush , Apple of Sodom ( English) , Calotropis procera ( scientific name) ) is used extensively by the Raika . 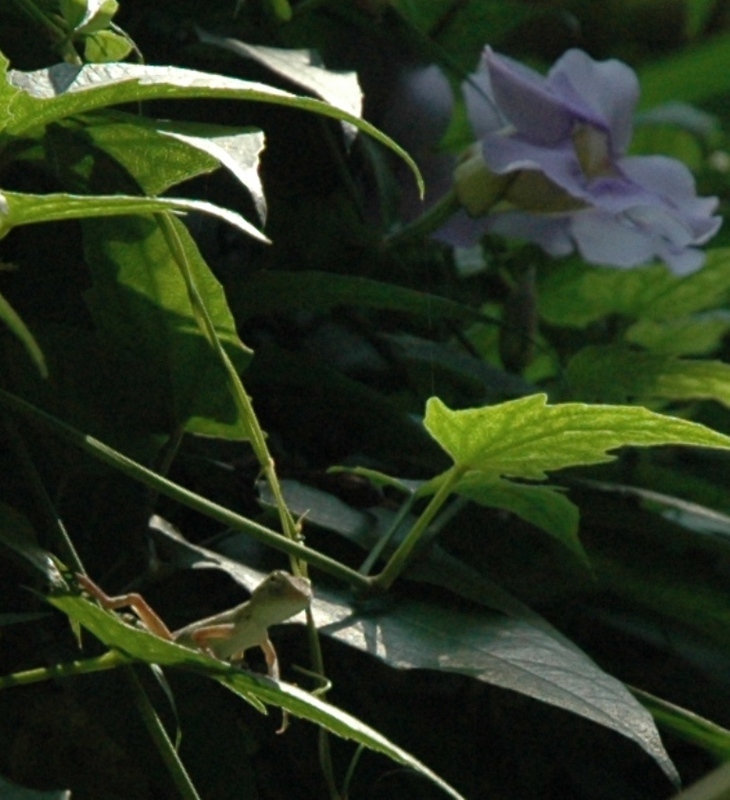 The leaves of the Aak have been used extensively by the Ayurvedic school of medicine for centuries and are supposed to be a great antidote to snake bites and a cure for jaundice as well. The Raika thus always keep the leaves tucked away in their extensive headgear. 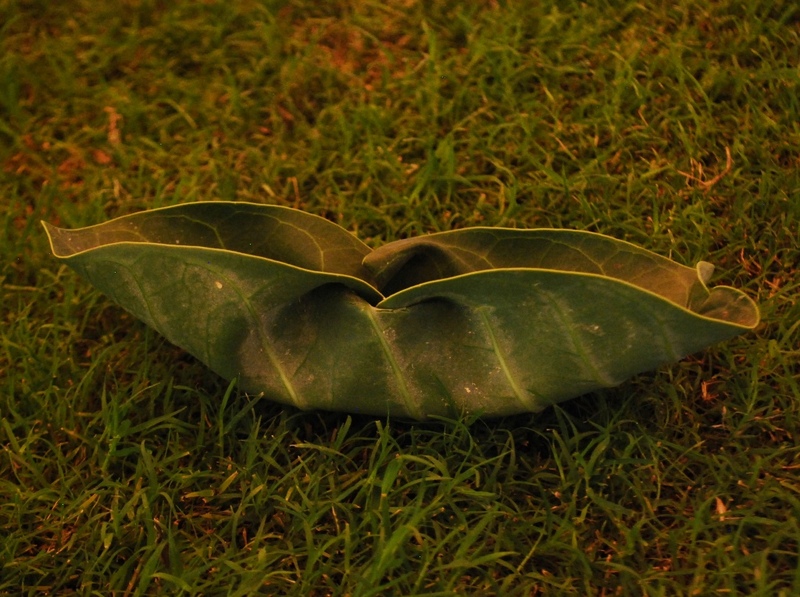 The leaves of the Aak make ideal containers to drink Camel’s milk. They are large , leathery and do not permit liquids to seep through them. The flowers of the Aak are revered and garlands are made from them and offered to Lord Shiva. Lord Shiva is also supposed to have absorbed the poison from the churning of the Ocean and saved all living beings from its effects. The milky sap of the Aak bush also contains some of the most vicious poisons like Calotropin. Much like Lord Shiva, the Raika have learnt how to transform the naturally occurring poison into a cure for numerous ailments. The Raika are a living enigma and a wonderful example of Mythology coming to life. Their beliefs and way of life are a wonderful example of maintaining harmony with nature even under adverse and harsh circumstances. The Raika are a truly amazing community but struggling to survive and preserve their ancient customs and way of life. Have experienced only a small glimpse of the Raika at the RIFF at Mehrangarh Fort in Jodhpur. 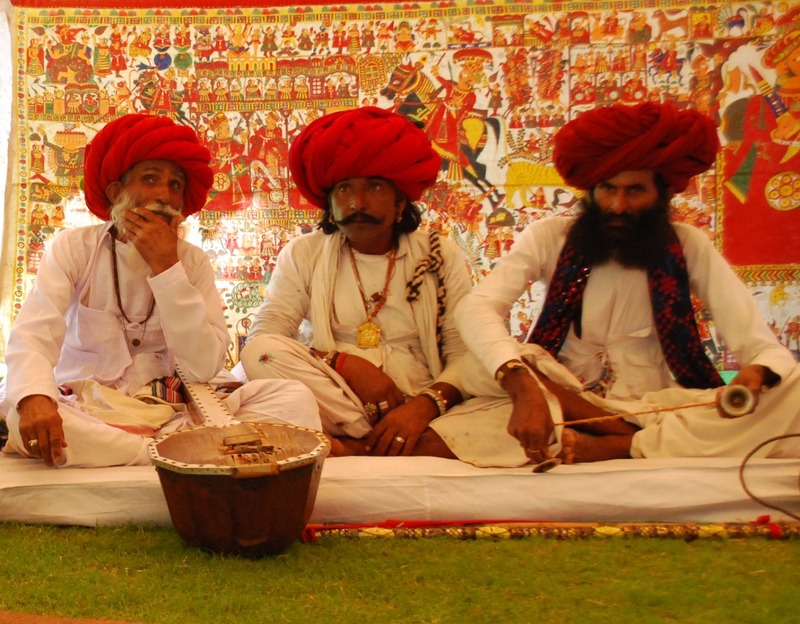 I believe there is a CAMEL FESTIVAL which celebrates this community in early November in Pali district of Rajasthan. Keep reading as more posts will follow. Fuschia (fyus-chia) is an attractive colour which is similar to Magenta. 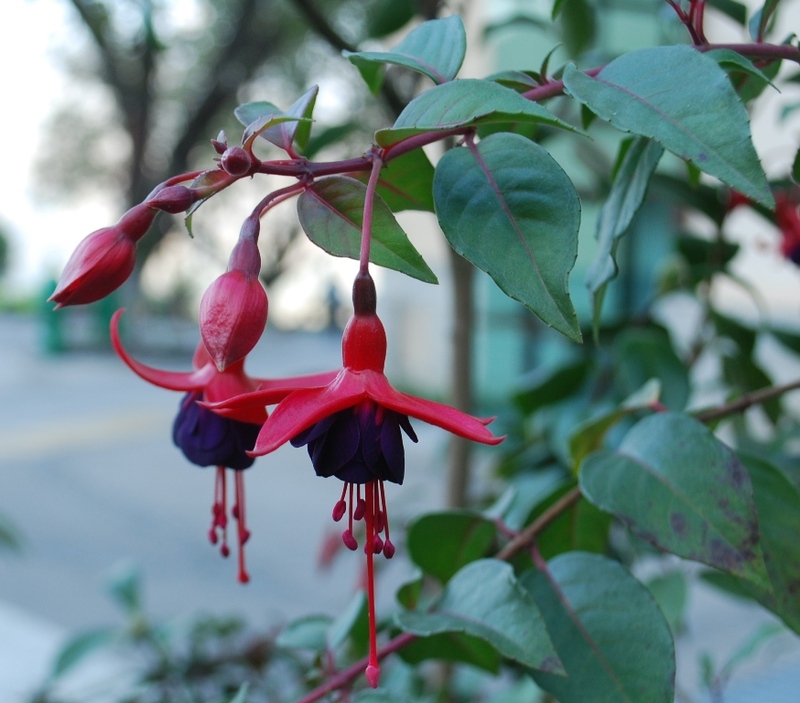 These lovely pendulous flowers in the driveway of JW MARRIOTT, Mussoorie bear the name Fuchsia ( mark the correct spelling) and adorn the colour Fuschia as well. Growing profusely in the shade I call these magnificent flowers TEAR DROPS OF JOY. 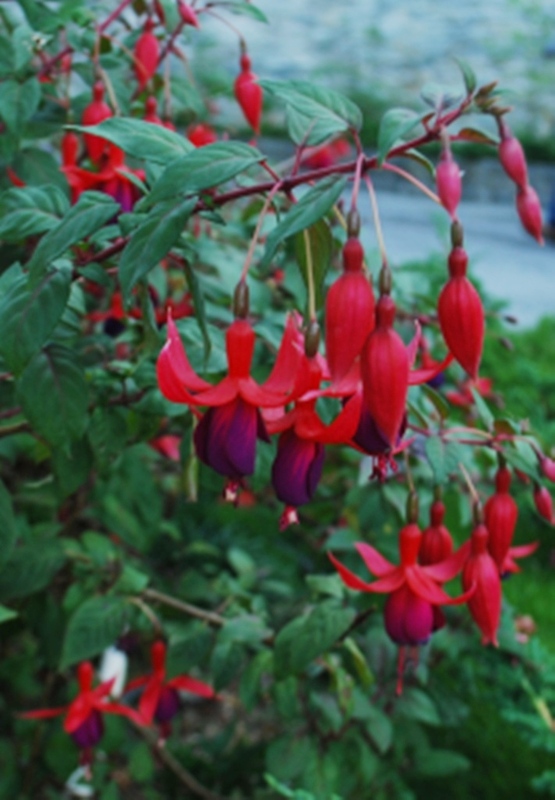 The flower is called Fuchsia ( fook-sia) in honour of the 16th Century German Botanist Fuchs. ( sorry, but that was the name of the scientist) It is rare for the scientific and common name to be same, this lovely flower shares this honour. 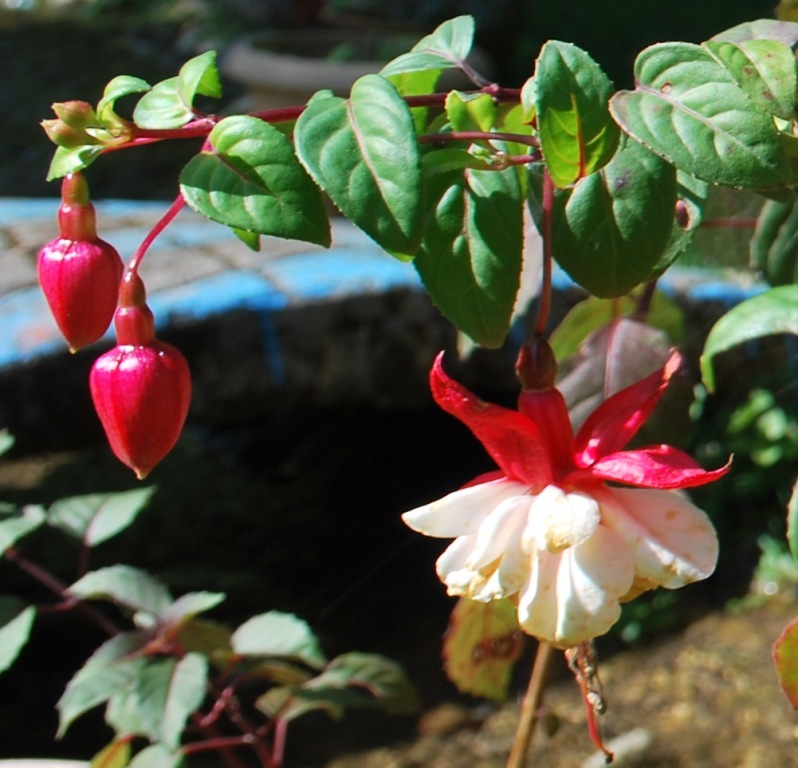 Scientific name is Fuchsia hybridia. ( there are however over a hundred species and the last name could change). 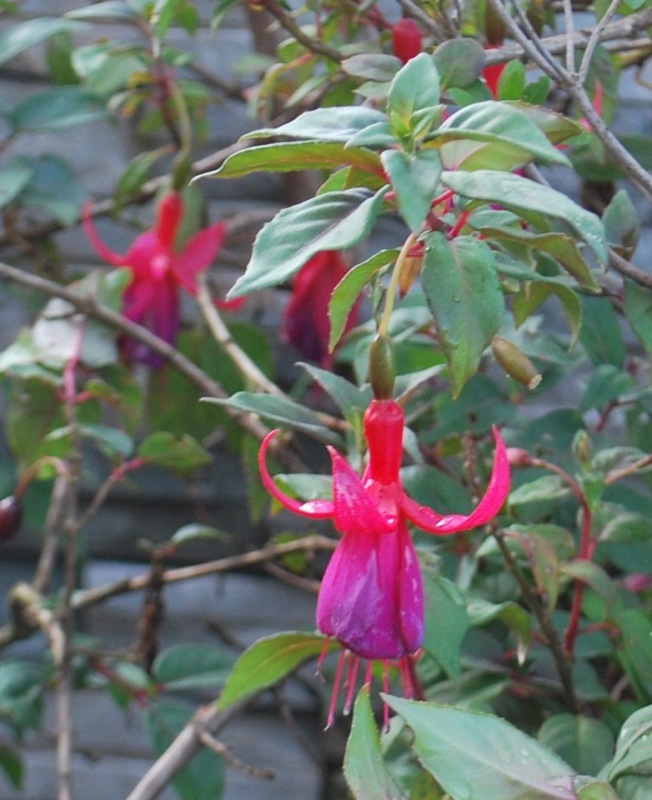 Do observe the colour of the stems as they turn Fuschia as well. This is obviously another species of this wonderful flower within the lovely garden of Prateek’s home and part of the Brentwood Sanctuary, Mussoorie. Please do read my previous posts ( THE WALNUT TRAIL, THE SECRET TRAP, THE CORN VILLAGE( http://www.travelwithmukul.wordpress.com) and THE MUSHROOM TRAIL ) to connect the dots. The buds look like a Lady’s Ear Drop, which is also another common name for these stunning flowers. The petals and sepals seem to be in conflict as one gazes downwards and the other reaches out to the Sun. These gorgeous flowers are native to Central America and cannot bear the harsh summer heat of the plains of India. Hence they are relatively rare to see in this country. They however love the Himalayan mountain air and were adorning the gardens of the Hotel like little chandeliers. They also bear an edible berry ( the fruit of the Fuchsia) . Do try it and let me know how it tastes. Bearing testimony to the phrase ” LOOKS ARE DECEPTIVE”, a species of this gorgeous looking flower is an invasive weed in many parts of Australia, New Zealand and many Islands of the INDIAN OCEAN. Fortunately they brought me only TEARS OF JOY. 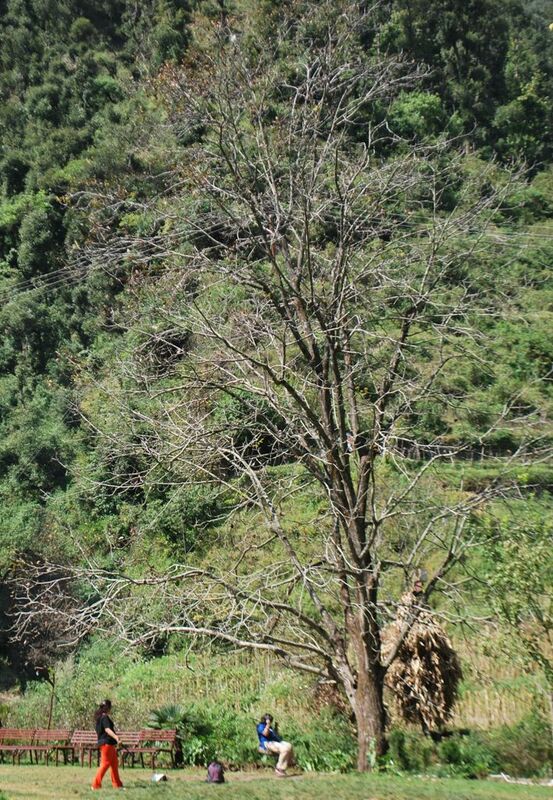 The prospect of seeing a Walnut Tree In Mussoorie was extremely exciting. Have seen carved Walnut furniture from Kashmir but do not ever recall having seen a Walnut Tree in Srinagar. The JW Marriott Walnut Grove Resort & Spa, Mussoorie gave me the chance to go on a fascinating trip called THE WALNUT TRAIL. From the lifetime first experience of seeing a walnut tree , to climbing it, picking walnuts and even planting a sapling we did it all. 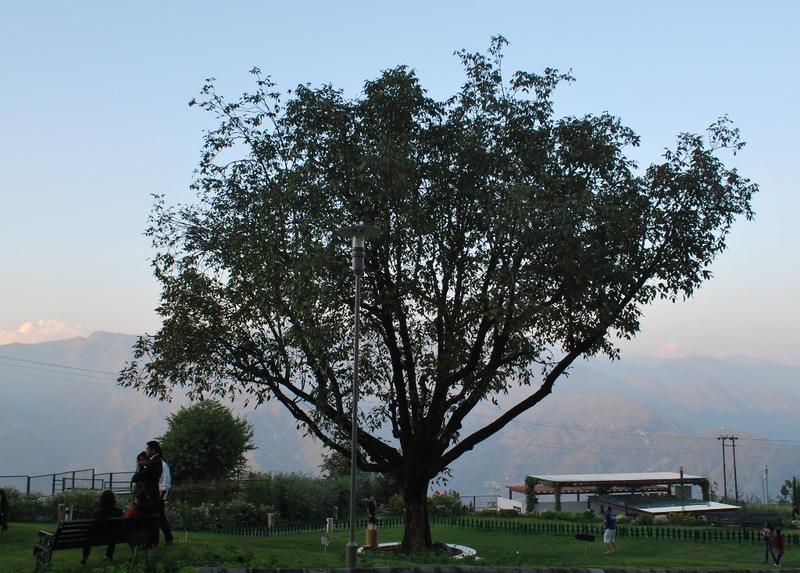 The Himalayas form the background to this Majestic tree in the gardens of The JW Marriott. The Walnut ( English), Akhrot ( Hindi) , Juglans regia ( scientific name) is a popular dry fruit and is packed with a pandora of nutrients. What is probably not as well known is that each part of the tree has a medical use. The following illustration I located on the internet gives a beautiful introduction to the leaves, flowers and fruit. Would you not like similar paintings in your rooms in the Hotel ? 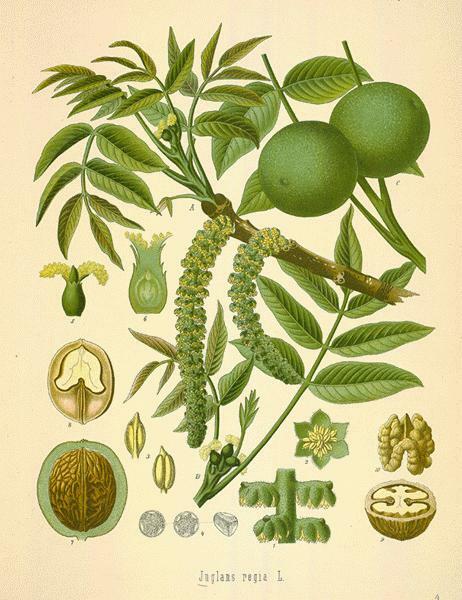 a botanical illustration of the Walnut . 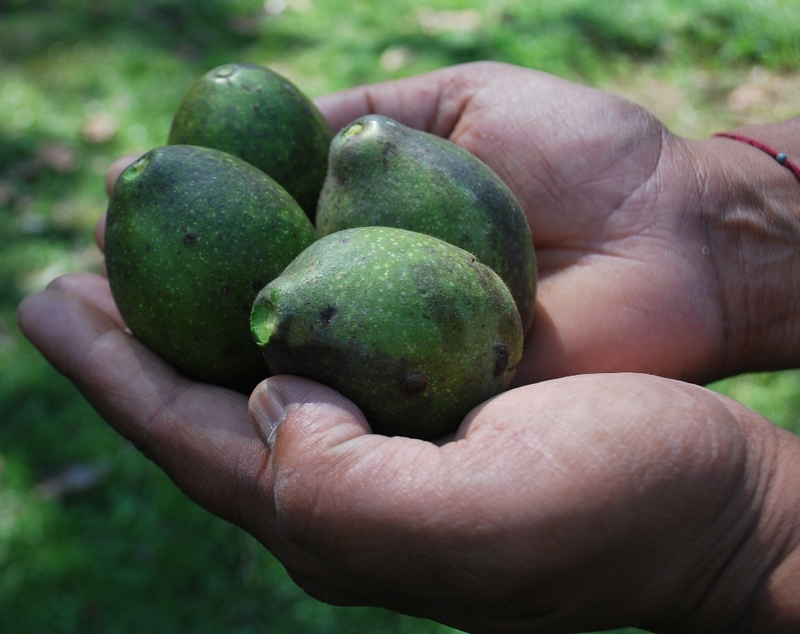 Freshly picked from the tree, this is how the unripe fruit looks. The green unripe fruit has numerous medical uses and has properties to destroy worms. When cut it has a distinctive odour and stains the hands as well due to the release of natural phenols ( napthaquinones) . 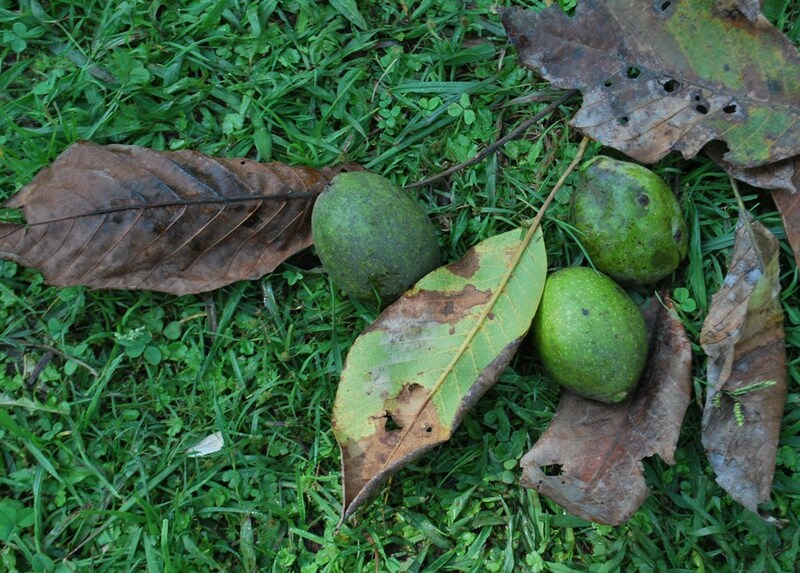 The Walnut tree is supposed to be a rich source of numerous naturally occurring organic volatile compounds. The pulp is used as a yellow dye for textiles.. The Walnut tree has its origins in Persia ( or modern Iran) but today is cultivated across the world. They say the Walnut tree has a very long life of upto 300 years. I will surely check on the fate of the saplings we planted in the years to come. 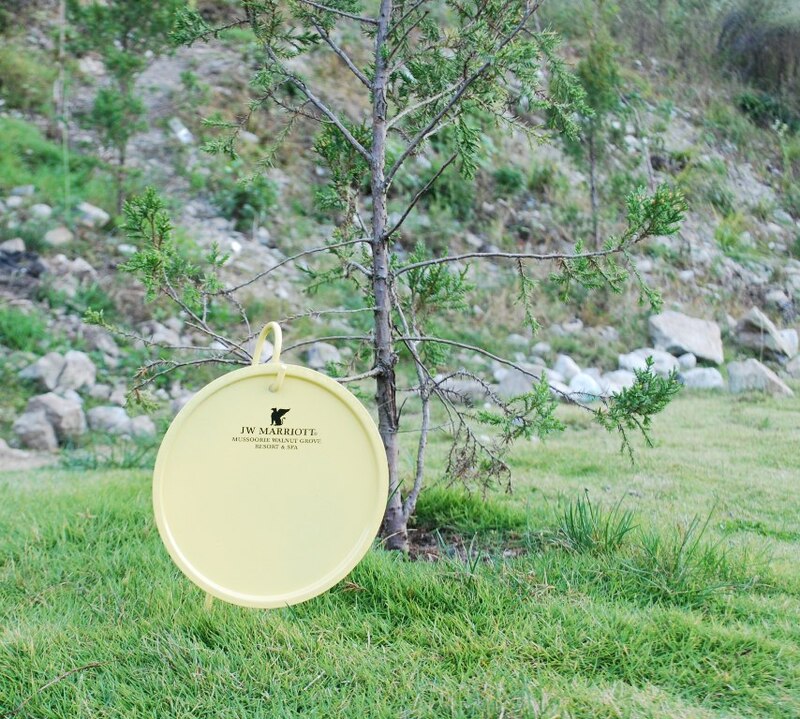 While planting a Walnut sapling in the grounds of the Hotel we were given a round yellow metallic disc ( see picture below) on which we could write our names. This was a wonderful ecofriendly idea by the team at JW Marriott. Hope it will be emulated by Hotels across the country, nay across the World. There is an ancient saying in Sanskrit, which says that planting a tree is equivalent to having Ten sons. The trees had shed most of their leaves by the end of September and those that remained had turned Brown . The leaves have multiple uses and are used to cure skin diseases like eczema and herpes. As Iodine is naturally found in the leaves , it finds an application as a natural gargle for the throat. The Walnut tree is a handsome upright tree growing to a height of 60 feet ( 20m) . The timber is used to make furniture. Can you spot any walnuts on the tree? I am still perplexed why I failed to notice these marvelous trees in Mussoorie when I was a school going kid . 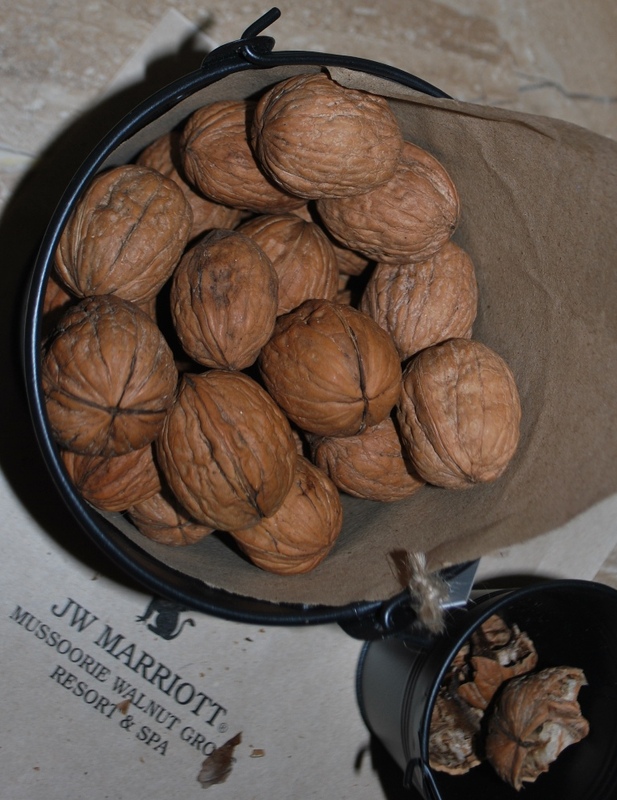 The now recognizable and familiar looking walnuts (alongwith nut crackers) were thoughtfully placed in lovely buckets in the rooms . Walnuts were in former times also called Jupiter’s Nuts. Jupiter being the male Greek God. Every part of the tree including the bark is used by Man . Even the shells of the Kernels are used to extract oil. The roots release chemicals to ward off pests too. 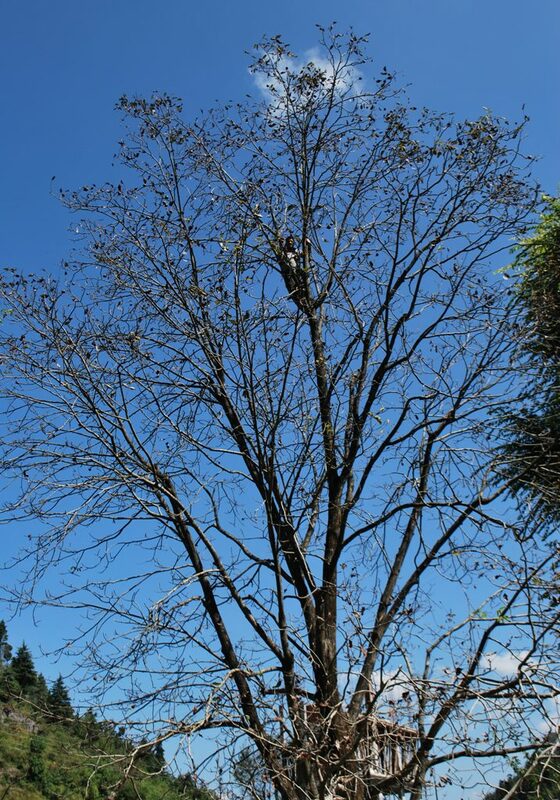 Due to the plethora of volatile compounds ( over 45) inhabiting the tree insects do not attack it. Can you spot the gentleman on the tree picking the Walnuts? Walnuts are supposed to be a cure for Alzheimer’s as well. A cloud crowns the Miraculous Walnut tree. It is indeed a gift by THE GODS. None of my posts are sponsored by anyone and are simply a honest sharing of my experiences. Keep reading THE WALNUT TRAIL is still not over. I could hardly resist taking pictures of these lovely lavender coloured flowers within the Dhanraj Mansion at Mumbai. The Dhanraj Mansion is a lovely heritage building located diagonally opposite the historical YACHT CLUB and THE TAJ MAHAL HOTEL ( do check out my blog THE GATEWAY TO INDIA at http://www.travelwithmukul.wordpress.com) . The Laurel Clock Vine is a vigorous climber and had covered the Gulmohar tree and formed the hedge in the mansion as well. 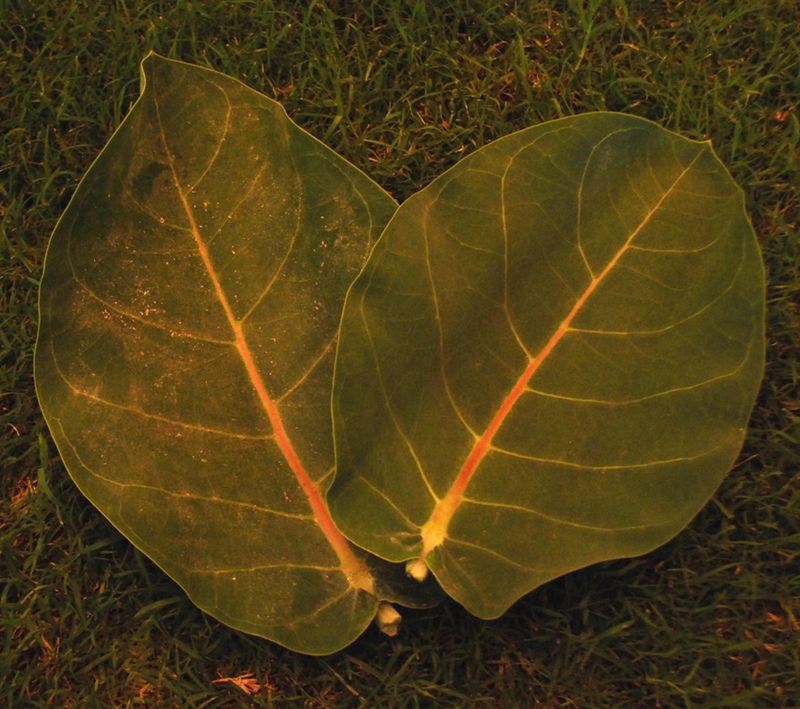 The heart ( or paan ) shaped leaves with their pointed tips adorn this creeper unique to South Asia. Unknown to me these attractive leaves serve as baby cradles as well. 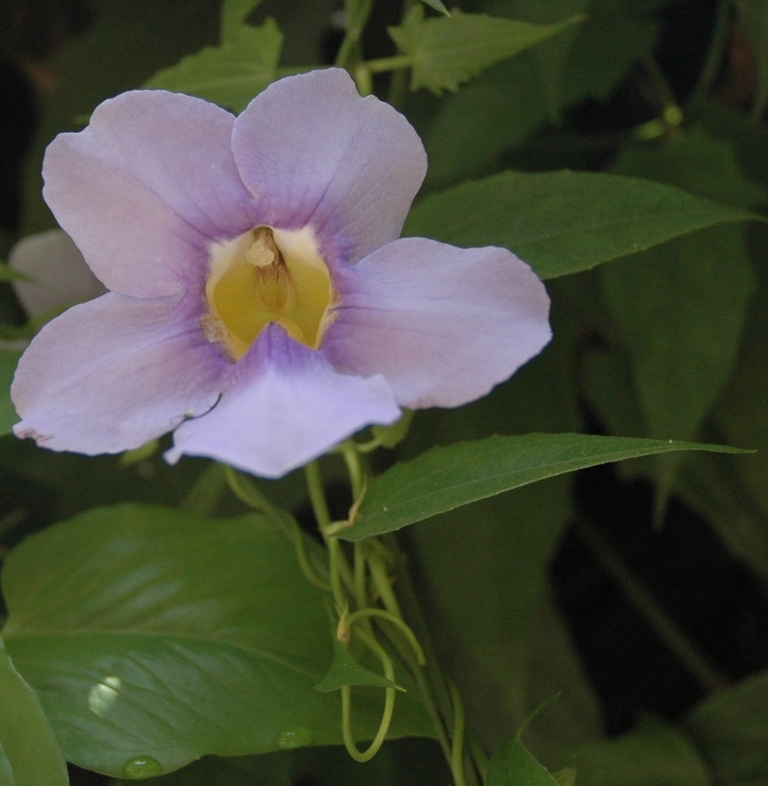 As I went closer to photograph the flowers of the Laurel Clock Vine ( Scientific name: Thunbergia laurifolia) I was surprised as two eyes inquisitively looked back at me . Nature springs a lovely surprise gift. 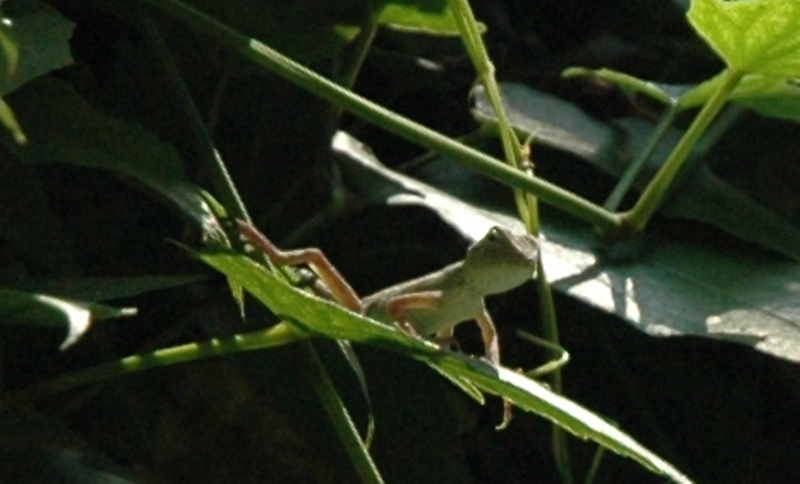 A baby chameleon ( I guess a few days old only) was probably on his first day out and had stretched out on a heart-shaped leaf. Have a look at the baby sunbathing on his cradle. Reminds me of the fairy tale of Thumbelina. How can I not share a close up of the gorgeous flowers which had beckoned me into this lovely mansion. Do observe the vine winds up clockwise giving the creeper its name . The guard of the mansion was extremely unhappy with my photographic acrobatics. Beating a hasty retreat I wonder if the inmates of the mansion ever saw the baby ? 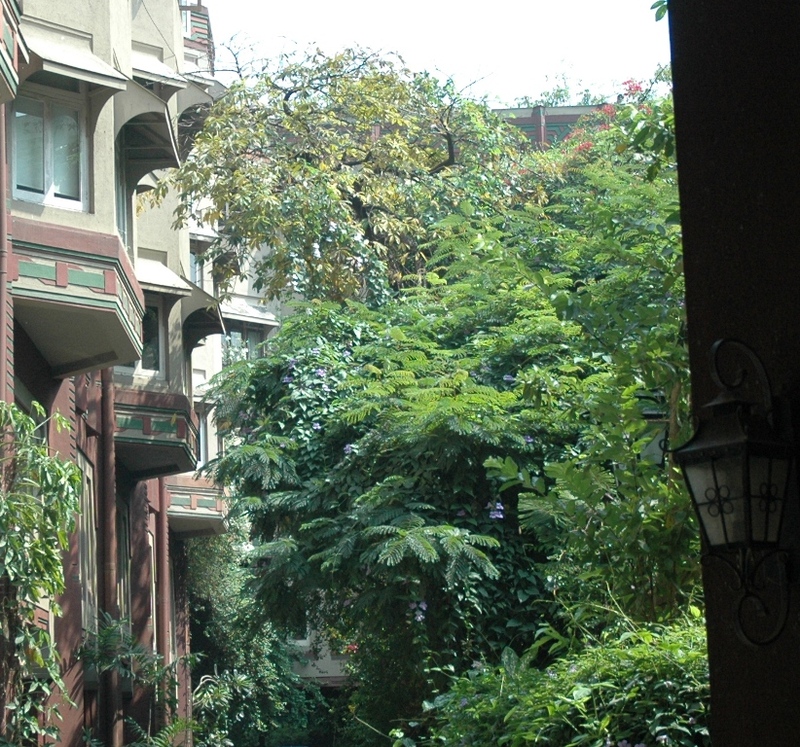 I had been enchanted in an Urban Forest in the midst of bustling Mumbai . Hope you discover the JOY OF NATURE in the cities you dwell in as well. Very often Nature casts a spell and leaves a message or a sign. 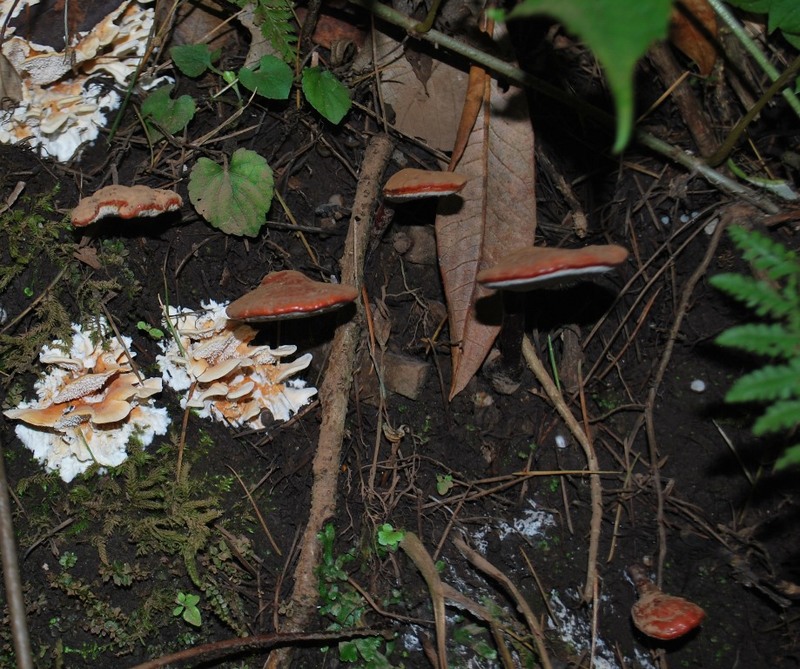 The featured image is of toadstool mushrooms in the lush gardens of the JW Marriott Walnut Grove & Spa, Mussoorie. It was probably the first picture I took in this beautiful Resort overlooking a stunning Himalayan Range. It was also a sign by Mother Nature for what was to follow. 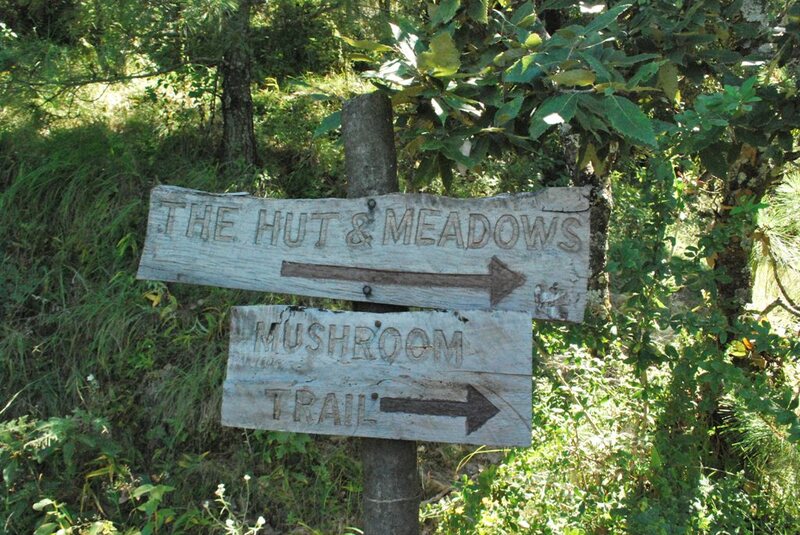 The following picture is of a signboard in the enchanting Jabarkhet Nature Reserve, Mussoorie. The J. Nature Reserve is part of a privately owned gorgeous enchanting forest . The Nature trek around FLAG HILL ( Jaburkhet Reserve is located on the Flag Hill) was one of several memorable trips organized by JW MARRIOTT under the umbrella WALNUT TRAIL . 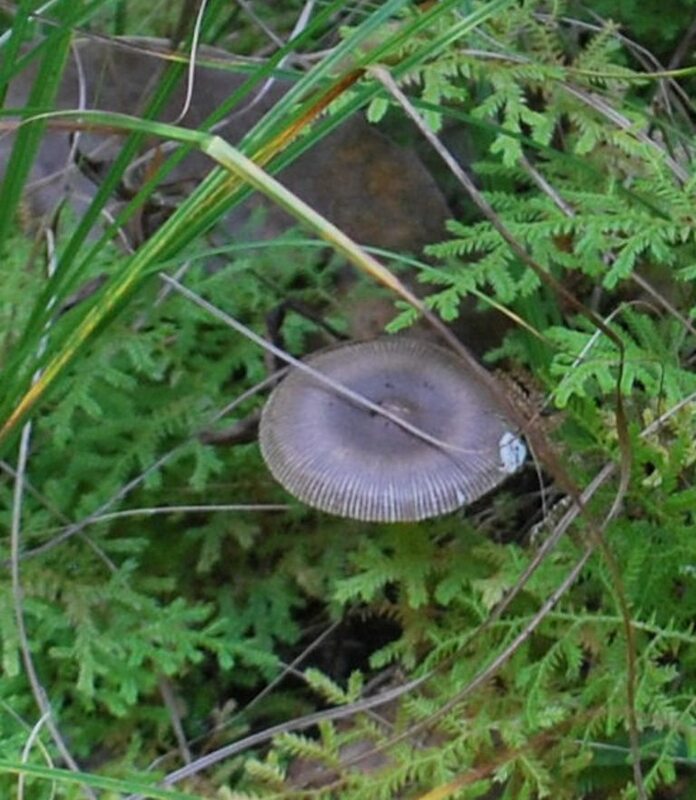 This mushroom resembling a Garden Umbrella was discretely camouflaged under some dried leaves . Am positive that even our cheerful group leader Aditya ( hope you read this post) missed this specimen of the Fungi family. As the J.Nature Reserve conscientiously guards the forests from intrusion the undergrowth in the forest has flourished. Deadwood is neither collected or tampered with and therein lies the secret of the abundance of Fungi ( mushrooms) . The lifeless stump of a tree had given birth to an unusual and attractive colony of mushrooms. The shaded mountainside preserves moisture which provides a perfect home for Moss. Moss in turn holds the topsoil of the mountain and is a reservoir for water as well. 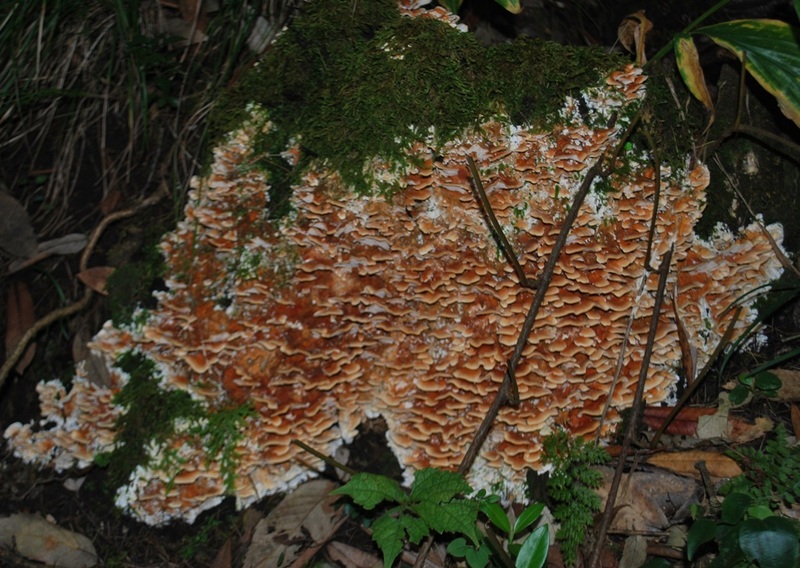 This unique and magnificent species of Fungi thrives in this delicately balanced ecosystem. Such glorious rare sights can be witnessed only in forests which are untouched by domesticated animals like cows and goats. 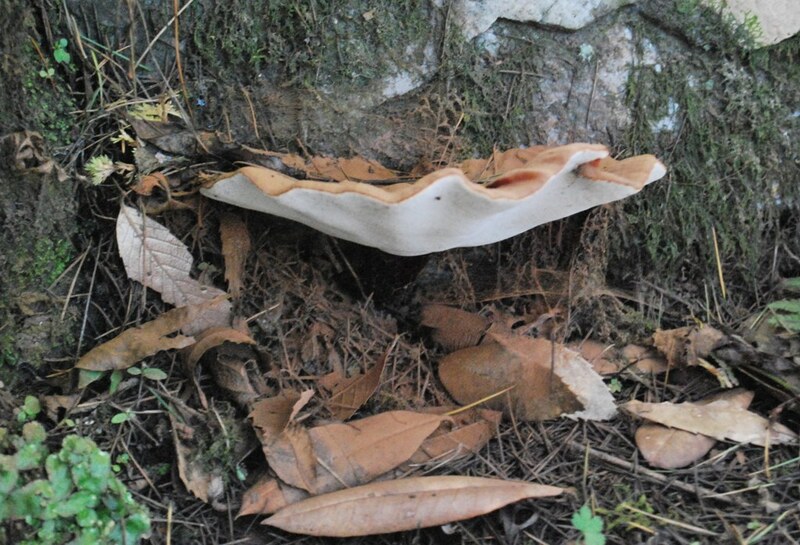 Bracket mushrooms adorn the mountainside . Homes for elves and fairies? 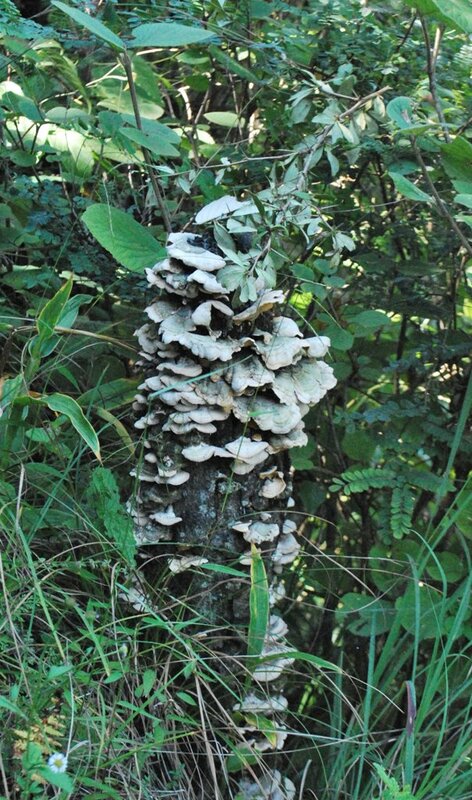 The largest and definitely the God Father of mushrooms photographed by me in this enchanting forest of the Himalayas. The tiny toadstools under the Walnut tree in the gardens of the JW Marriott Resort was my sign that I would shortly be on a Mushroom trail. Is it not ironical that I noticed the signboard read “Mushroom Trail” only whilst writing this article. 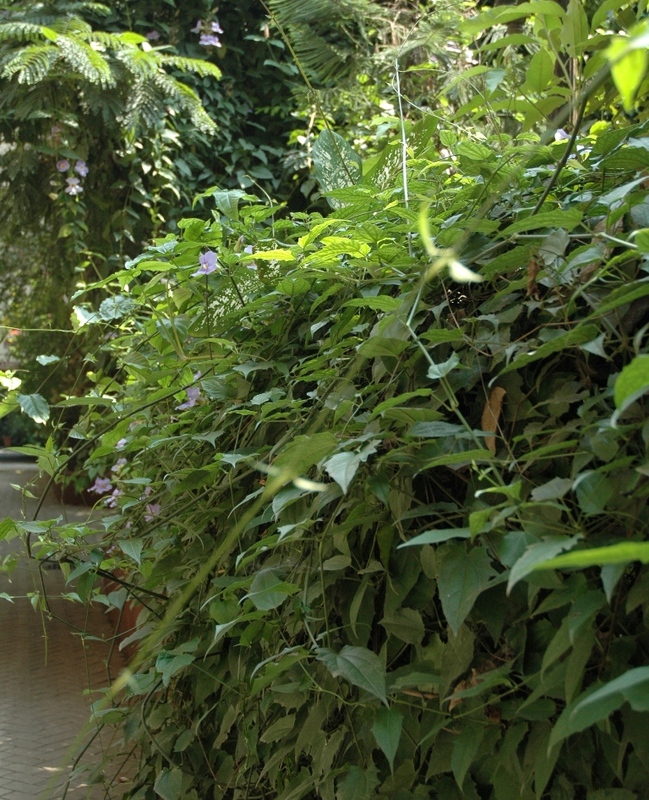 The luxurious JW Marriot Hotel at Mussoorie has studied nature beautifully. They organized an enchanting trip called Walnut trail. Pictures that follow are part of this splendid trail. 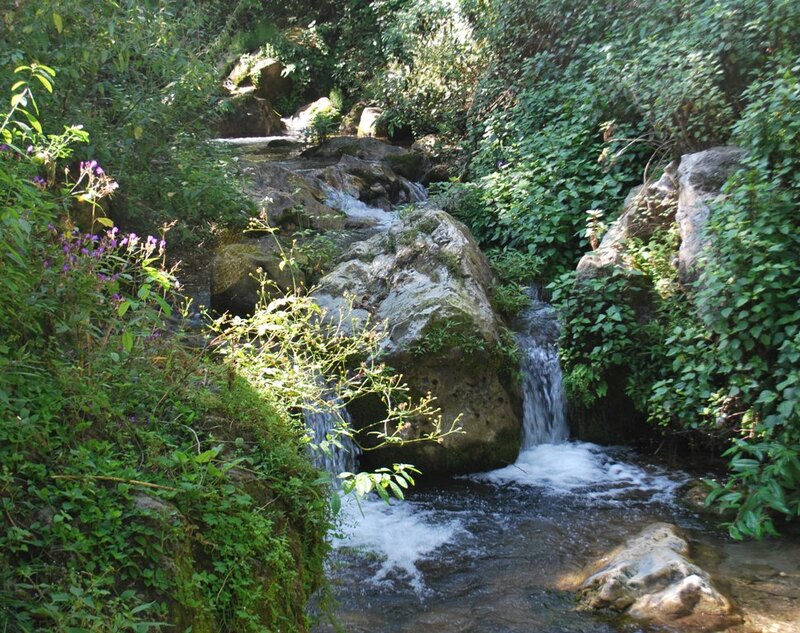 What a delightful sight as the mountain spring gurgles down the mountainside. 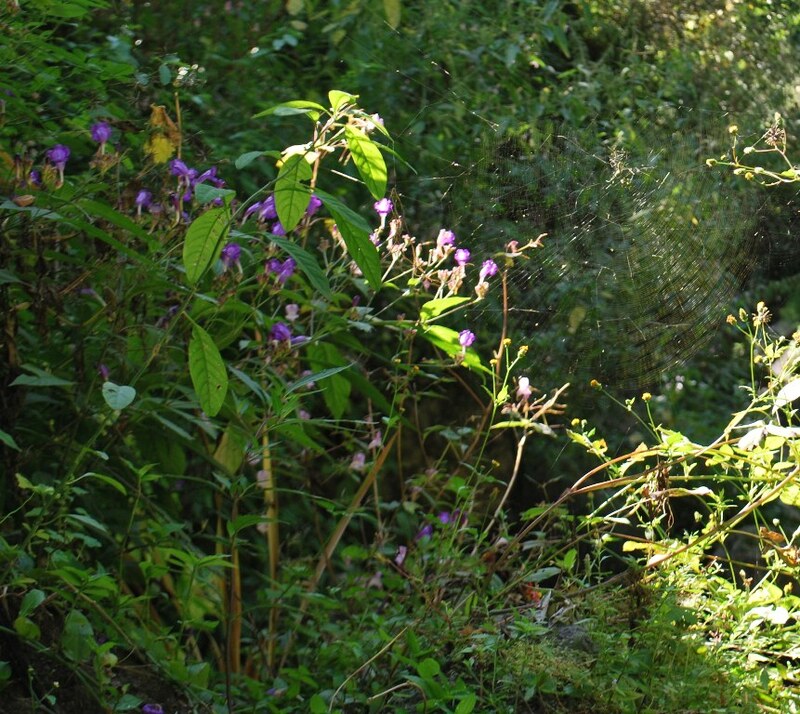 The gorgeous violet and yellow wildflowers sway with the gentle cool breeze and the sunlight filters through the undergrowth around the mountain stream. A gentle movement and a glimmer in the sunlight reveals another marvel of nature. 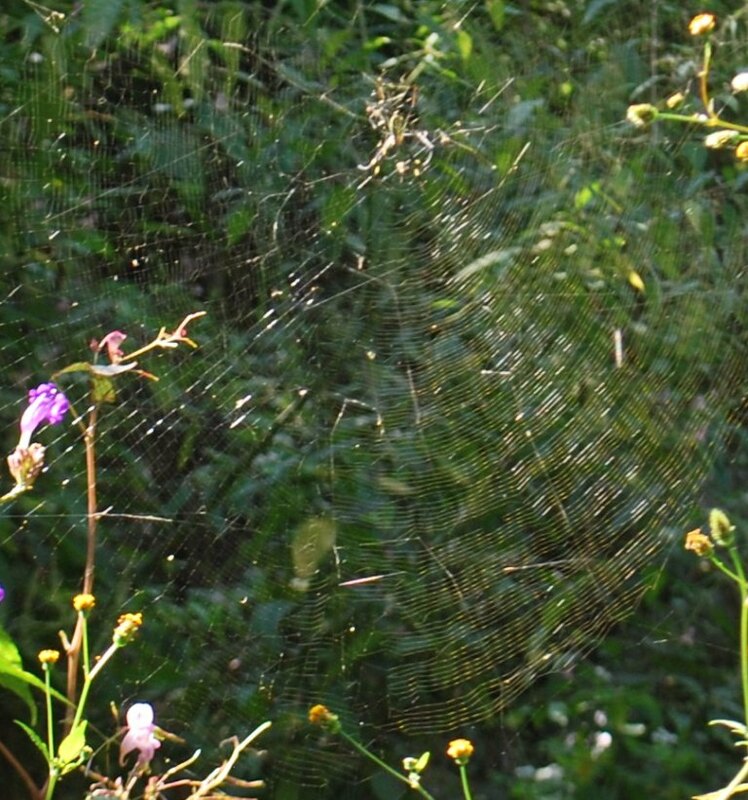 Strategically placed between two species of wildflowers is a perfectly made spider’s web. The rays of the sun reflect off each strand, revealing a marvelous trap setup for insects that would approach the flowers. A spider patiently awaits it’s prey and sits right in the centre of this circular web. 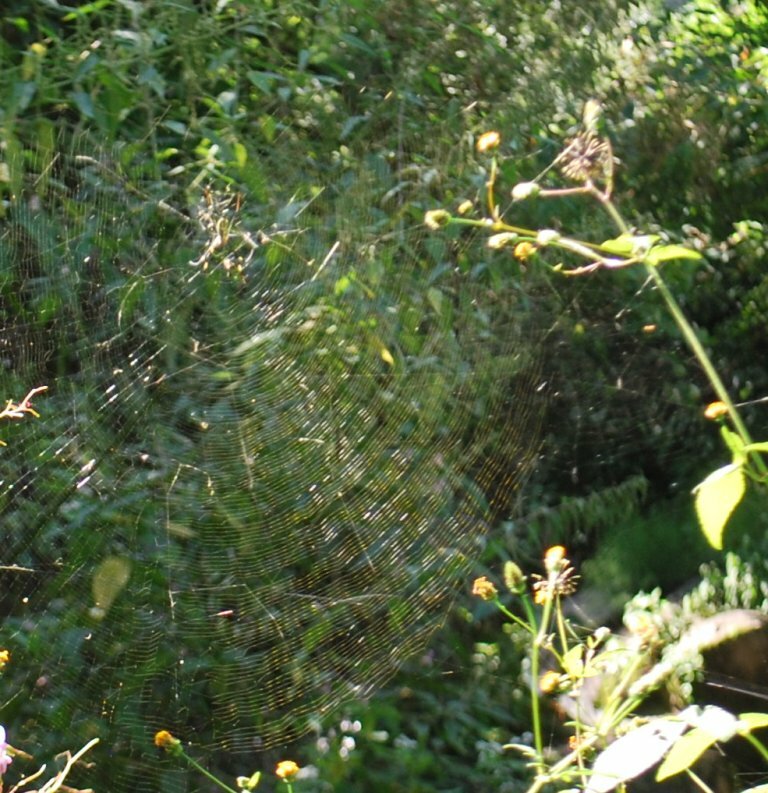 The Spider has chosen a perfect location to weave a geometrically perfect web. What can we learn from the Spider? Do comment.